Congratulations to Mrs Hanna Year 7 and Mrs Enright Year 6 who are now recognised IZAK 9 Super Users and Trainers. IZAK9 is made up of 27 cubes and used during numeracy lessons. It is being integrated across each year band and they're opportunities for everybody, regardless of age or ability. Izak 9 tasks are now intergrated into medium term plans and weekly plans. This resource is now a platform for numeracy teaching in SOP. Across the school, all teachers and classes are committed to using the resource and they find it has helped encourage a more positive attitude towards numeracy. stimulates Thinking Skills and Personal Capabilities as well as providing Assessment for Learning opportunities. 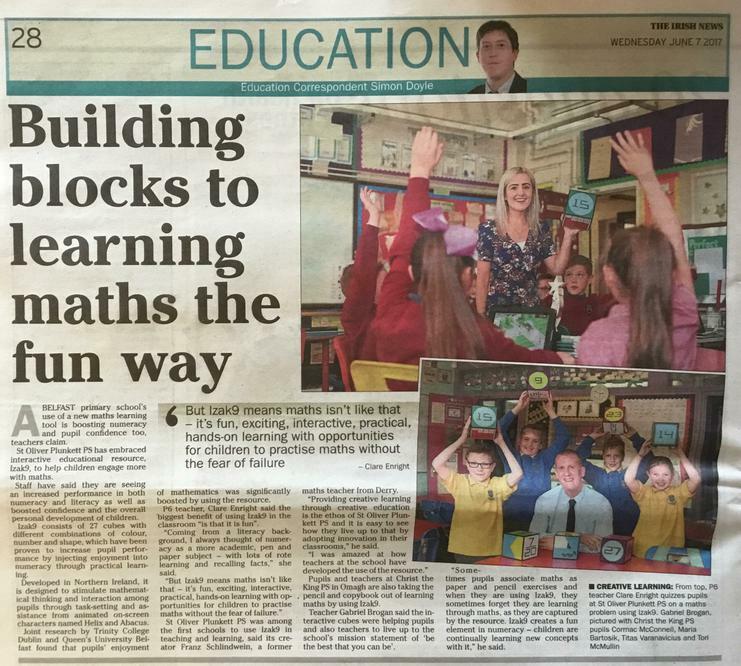 One focus of our recent school development plan was to develop problem solving skills and language. Izak 9 has certainly been a catalyst in giving children the opportunity and confidence to talk about their own strategies and problem solving methods.